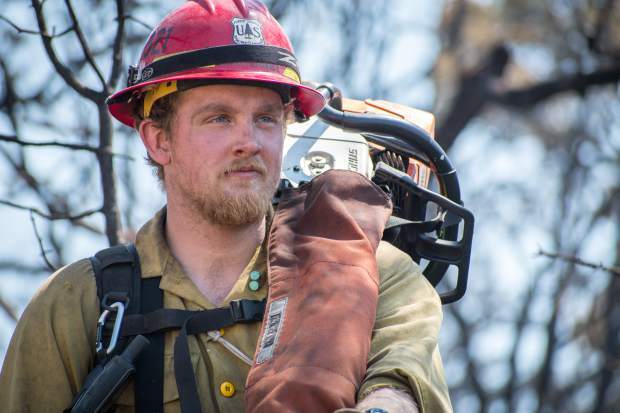 Washington state firefighter Tanner Mawhinney assesses the charred landscape before heading out to help tackle the Lake Christine Fire on Monday morning. More families were able to move back home Monday night, July 9, as the evacuation order for the Lake Christine fire was lifted for residences in the Missouri Heights neighborhood, east of Upper Cattle Creek Road. “I’m thrilled,” said attorney and Blue Creek resident Jody Edwards, who learned the news at Monday’s community meeting at Basalt High School. Edwards, who has been evacuated since July 4, was one of about 10 residences who were displaced by the mandatory evacuation order. About 20 homes off of Frying Pan Road from Pinon to Cedar Road remain under mandatory evacuation. Keith Brink, operations section chief for the fire, said it’s too dangerous in that area because power lines are still on fire. Crews are working around the clock with the power company. El Jebel Road leading to Missouri Heights also opened on Monday. The fire grew 200 acres from Sunday to Monday. As of Monday evening it was estimated at 6,100 acres, or nearly 9.5 square miles, according to the interagency Northern Rockies Incident Management Team. The fire is considered 39 percent contained and officials hope to be at 45 percent or more on Tuesday. Brink said seven crews — about 200 firefighters — were reassigned on Monday to other fires in the region. “We wanted to fit the personnel with our objective,” Brink said of “right sizing” the team for the blaze. Around 350 firefighters remain on scene. The Lake Christine Fire started on July 3 after two individuals allegedly shot tracer rounds at the shooting range in Basalt. The El Jebel residents have been charged with felonies. Officials with the incident team estimate that the fire has cost $3.7 million as of Monday. Three homes were lost in the blaze, estimated to be $2.65 million in property value. Most of the fire’s growth is in the northern end — heading away from developed areas and the dark timber of Basalt Mountain. The blaze is in uncontrolled in steep, rugged terrain. It is likely to continue to spread in that direction “for some time,” according to the management team. The south end of the fire, near the most populated areas, has been contained for the most part. Brink explained that crews are being systematic along that edge to make sure all hot spots have been put out. Meanwhile, commercial airlines using Aspen-Pitkin County Airport are on temporary flight restrictions so crews can attack the fire from the air. Beginning Tuesday, commercial flights can take off but cannot land, based on flight patterns. Deputy Incident Commander Roger Staats said his agency, along with the Federal Aviation Administration and airport director John Kinney, are devising a plan that should allow for getting aircraft in and out soon. Private aircraft are allowed to fly because they are under fewer restrictions; pilots can rely on visual approaches rather than instrumental. Staats said the forecast calls for some moisture later this week, which will help tame the blaze. “Things are looking a lot better,” he said.